The sage-pecan pesto recipe came about after Kalyn asked fellow food bloggers on Twitter what to do with a “huge surplus” of sage in her garden. “Making pesto was the first of several good ideas people mentioned for using fresh sage,” she writes. “My recipe is fairly heavy on cheese and nuts, and I also put (in) a pretty generous amount of garlic to balance the strong flavor of sage.” The pecans add a nice flavor twist. Kalyn encourages experimentation. “If you happen to try this recipe, I encourage you to adapt it to your own taste,” she says of the pesto. The recipe produces four cups of pesto, far more than you’ll need for the squash. You can reduce the recipe — or do as Kalyn does and freeze the pesto in ice cube trays. Each cube, she says, yields about 3 tablespoons. Preparing the squash is easy. Cut squash is tossed with extra virgin olive oil, salt, and pepper and roasted in a 400 degree Fahrenheit oven for about half an hour, until the pieces begin to soften and brown slightly at the edges. 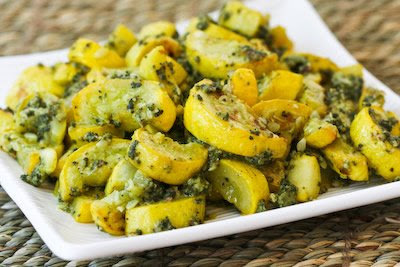 The roasted squash is tossed with the pesto. You could use leftover pesto with other dishes — spread on roast chicken, maybe, or tossed with roasted new potatoes. Or why not pasta? Let your imagination run wild.